If an animal is holding habitual tension in certain parts of the body it will affect their ease of movement and physical balance. When out of physical balance, confidence and the ability to cope in a range of situations can be seriously compromised. Many things can affect physical balance and the nervous system can quickly form the habit of holding the body in an awkward posture. Puppies grow quickly and can often start to move awkwardly as their body grows at different rates, affecting physical balance. They also go through 'fear periods' during development. This emotional response can encourage them to hold tension patterns which affect posture and go full circle to further affect emotional response. 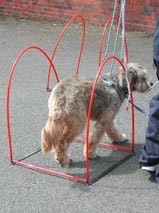 This encourages erratic, fast movement where the puppy starts bumping and banging into things and people. Emotional tension is often held in the jaw and the puppy often starts to mouth again as a coping mechanism to release this tension. This is often seen as naughty behaviour, in truth the puppy can't help it as it does not have the experience to move in any other way. A dog's normal pace of movement is faster than a human's walking pace. Puppies need to learn how to co-ordinate their body and walk slowly in order to be able to walk on a loose lead, greet people calmly and use their body language to communicate well with other dogs. 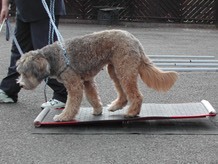 An example of how normal growth and development can affect a puppy's physical and emotional balance. Note how Trance's hind end is higher than the front, throwing her weight forward. There is nothing physically 'wrong' it was just the way she was growing but it affected her ability to communicate well with when meeting strange dogs at a critical time in her development. Some perceived a threat because her movement was fast, erratic and forward tilting so they felt challenged by her. This in turn affected her confidence with new dogs. She started to behave defensively 'just in case' they were going to attack her. 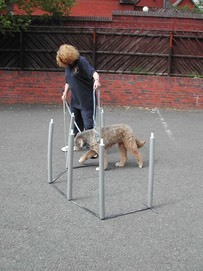 Groundwork exercises helped her to move more slowly and in balance. 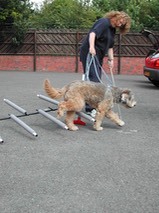 This significantly improved her interaction with other dogs and prevented the development of a difficult behaviour problem. Note the pressure put on Jake's front legs, neck and head as his posture adjusted to accomodate his disability. He still managed to have fun playing 'catch the water from the hose pipe' and to get into all sorts of mischief to keep us on our toes. Jake had a progressive back condition which seriously compromised his mobility. He could not have an operation to help because there were too many vertebrae involved. As they wore away at the base, the nerves got pinched and damaged and he lost a lot of sensation in his hind legs and tail. 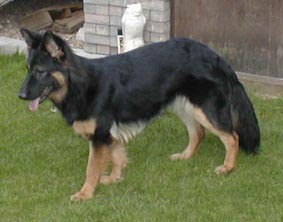 He was a large and energetic dog, standing 28" at the withers. When he was x-rayed 3 years before this photo was taken and we saw the extent of the damage, his potential to continue to enjoy life looked very bleak. Hollycroft Veterinary Centre looked after Jake's primary care and medication, he received accupuncture to aid pain relief on referral to Acorn Vets. Swimming at Corley K9 Pool helped to make him feel good in the non-weight bearing freedom of the water and maintain as much muscle tone as possible in his hind legs …. so where does TTouch come in? The gentle groundwork exercises helped him to adjust mentally and adapt physically so that he was still mobile. The daily body TTouches helped to comfort and relax those poor overworked shoulders, neck and leg muscles and gave him a sense of well being. The result? 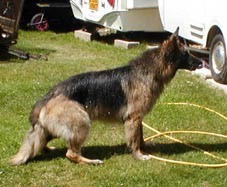 A dog who managed to adjust to his disability and still keep his amazing enjoyment of and zest for life. Over excitement or fear can encourage animals to hold tension in certain parts of the body. This can affect the ability to move in physical balance which in turn feeds the emotional state, locking them into a cycle of boistrous or reactive behaviour. This beautiful young labrador is boistrous and 'pulled' on the lead. In reality she leaned into the lead to enable her to stay upright because she had not learned to move at the much slower, human walking pace and maintain her balance. 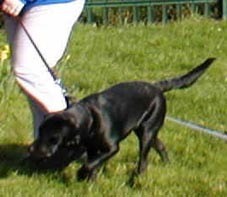 Notice how the pressure of a single connection on her collar/lead causes her body to twist away at the front, away from the handler's leg. This caused a lot of discomfort to her owner's shoulder and back while they are walking. Using a harness and flat collar with a double clipped lead helped us to teach her how to keep her weight over her legs and move slowly, without having to lean into the lead. This lively little Jack Russell was very noisy and reactive to other dogs while on the lead. Note how he leans into the lead, even with the double connection of harness and collar. He cannot keep his balance even when there are no other dogs around. 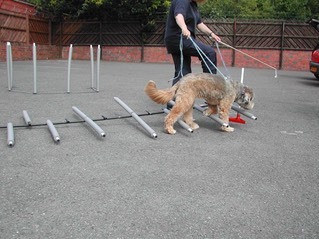 The 'Journey of the Homing Pigeon' with handlers leading from both sides helps the dog to keep its balance while negotiating the twists and turns of the Confidence Course. 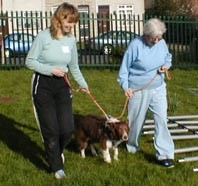 The Confidence Course helps to teach co-ordination and balance. 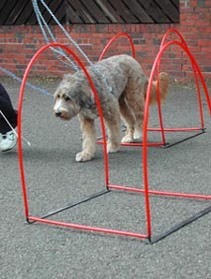 We use objects on the ground to teach dogs to move slowly and with awareness of their movement. 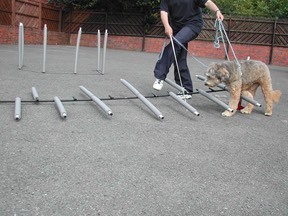 It is very easy for most dogs to rush blindly around these objects but when we ask them to slow down, halt and re-balance they can find it difficult and challenging. Fluffy is demonstrating how the 'step-over' is used to teach dogs how to use their legs mindfully and independently. The soft poles can be set at different distances, heights and angles. A wand is being used to help her focus on the direction we are moving. A soft rope harness is being used to help her to balance as she learns to lift each leg independently while moving slowly. Sometimes a dog will freeze and just not know which leg to move next. The legs and body can be gently stroked with the wand to encourage the nervous system to make a connection and move the limb. The wand prevents the handler crowding or leaning over the dog. 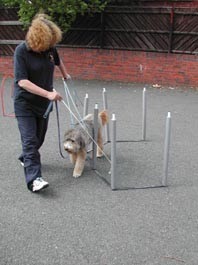 These soft poles can be adjusted to different shapes and angles to help Fluffy to learn how to co-ordinate and shift her weight over her legs as she curves and turns. Notice how hard she is having to concentrate to do this slowly. Again the wand is used as an additional directional cue. 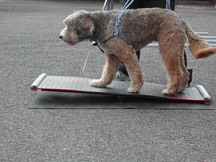 The Teeter-Totter helps Fluffy to move up a slight incline, halt and re-balance as the board tips forward slightly so that she can walk calmly and slowly off the other side. This sort of exercise is a really useful to improve balance while moving. 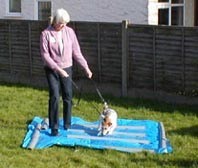 It can really help dogs who find car travel challenging. The labyrinth also teaches a dog to change direction and remain in balance as she comes to a halt after turning the corner. The direction signal of the wand helps her to lower her head and move forward in balance to take the final turn. 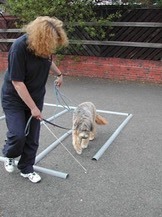 Reactive dogs can often be more easily de-sensitised to the presence of other dogs outside the labyrinth while they are inside it. We can then progress to them following other dogs through it. The hoops provide another variation of equipment to step over and through. Confidence course exercises can be varied by using different textures of surfaces, hard-standing, grass, rubber matting, canvas. 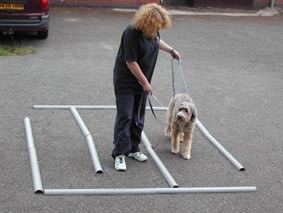 The Low Walk Over, just inches from the ground (not shown here) is also a really useful piece of equipment to teach a dog how to negotiate ramps and steps with confidence.